We are pleased to welcome you back to the next year of your postgraduate program. We are pleased to provide on-line registration. Please note that you will be guided through the registration steps within the on-line system. In some cases you will not be permitted to proceed through the steps until you complete the necessary pre-requisites. Before you begin the registration process, you may wish to review the registration tabs at the top of this page. You will need to satisfy all of the criteria to register with the Postgraduate Medical Education Office. Please note that you must be registered by June 29, 2019 in order to continue your training. Please note that you will not be allowed to start in your program if you are not completely registered. All inquiries about registration with the Postgraduate Medical Education Office are to be directed to pgme@queensu.ca or by calling (613) 533-2543. To go directly to the registration system, click here. Verify all details provided in the personalized letter of appointment. The academic year is from July 1 to June 30. Confirm your acceptance of the Letter of Appointment. If the details are not correct, do not accept the letter of appointment. 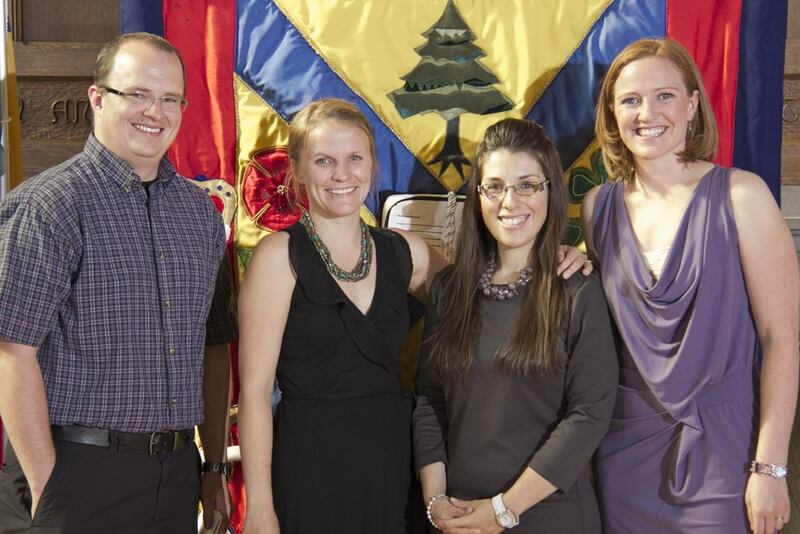 Contact the Postgraduate Medical Education Office at pgme@queensu.ca or by calling (613) 533-2543. Once you have verified the details, you may print a copy of the letter. 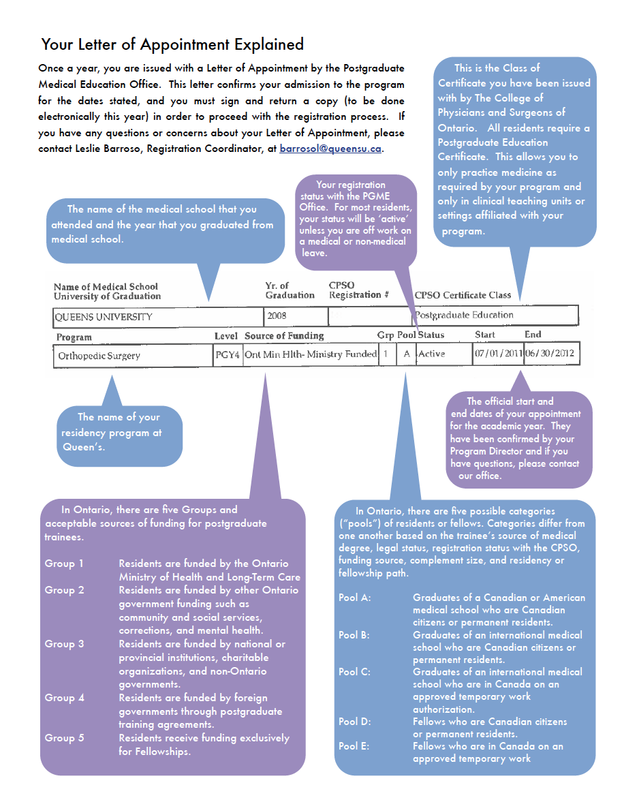 You will receive a copy by email once you have completed all of the Queen’s PGME registration steps. The Postgraduate Medical Education Office (PGME) will also receive a copy of the your letter of appointment. The PGME office will submit your letter of appointment to the CPSO. You must not submit this directly as it will not be accepted. Your College of Physicians and Surgeons of Ontario license (officially known as a Postgraduate Education Certificate) must be renewed. A renewal will be processed once the CPSO has received confirmation of your re-appointment from the Postgraduate Medical Education Office AND you have paid the license renewal fee to the CPSO. If you have not received your renewal certificate before the starting date of your appointment, you must contact the CPSO Registration Department to confirm that you are registered. For further information about renewing your Postgraduate Education Certificate, pleases refer to the CPSO website. Please review the Frequently Asked Questions prepared by the CPSO to ensure that you are ready to complete the renewal with all of the required information. Please note that you will also be required to pay the provincial postgraduate registration fee of $770 at the time of registration by credit card. You are advised to print your confirmation receipt at the time of payment as receipts are not issued by the PGME Office. **please note that the registration fee must be paid using the PGME on-line registration system. Do not pay using your Queen’s Solus account. You will be prompted through the steps within the on-line registration system to complete the re-appointment requirements. Your application should be made well in advance of the expected date of appointment as the credentialing process is lengthy. *please note, some residents and clinical fellows will not have to complete all of the forms. Only the forms that you have to complete will be available to you once you log into the system. Follow the directions provided by KHSC and submit your documents accordingly. 1. You will complete an Application for Reappointment to the House Staff. For Family Medicine Residents in the Belleville-Quinte, Peterborough-Kawartha, and Bowmanville Oshawa-Lakeridge Programs, please complete the appropriate applications for housestaff privileges at your respective hospitals. 2. You will complete a Resident Contract Letter. When all required documentation is received, your name will be included on a listing indicating completion of all hospital registration requirements which will be forwarded to the Chief Executive Officer or delegate who shall immediately refer the listing to the Combined MAC Credentials Subcommittee. It will then be forwarded to the Medical Advisory Committee which in turn will make recommendations to the Board of each hospital, which makes the final decision. Should you be refused appointment, you may apply for a hearing under Sections 37 and 39 of the Public Hospitals Act of Ontario. 3. You must ensure your Mask Fit Test (N95 Respirator) is valid. The test must be completed every two(2) years and the results must be provided to Occupational Health, Safety, and Wellness, KHSC. 4. Review and ensure compliance as required with Occupational Health and Safety requirements. The OHS&W Department is open Monday-Friday (0700-1600) and Occupational Health Nurses (OHNs) are on call weekends and holidays (0700-1900) to deal with more urgent matters and may be reached by calling the switchboard. In addition, an Occupational Health Physician is available for consultation upon referral by the OHN. Serve as resources to employees on health & safety issues/concerns and make recommendations to address/resolve health & safety issues.